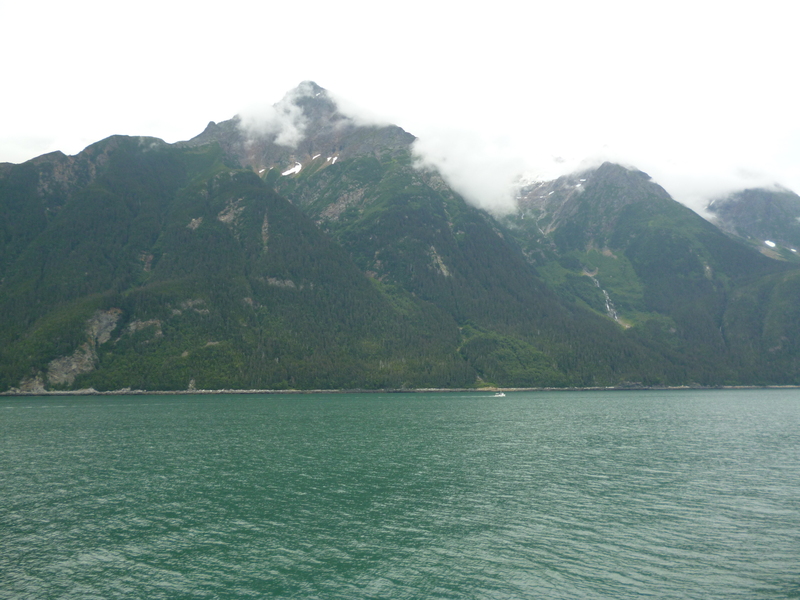 We boarded our last ship for this trip out of Juneau heading for Haines. The sky was the clearest we had seen in days and even though we had already made this trip once before during our initial route, we were able to see the beauty of the mountains that we missed on the previous day in the rain. 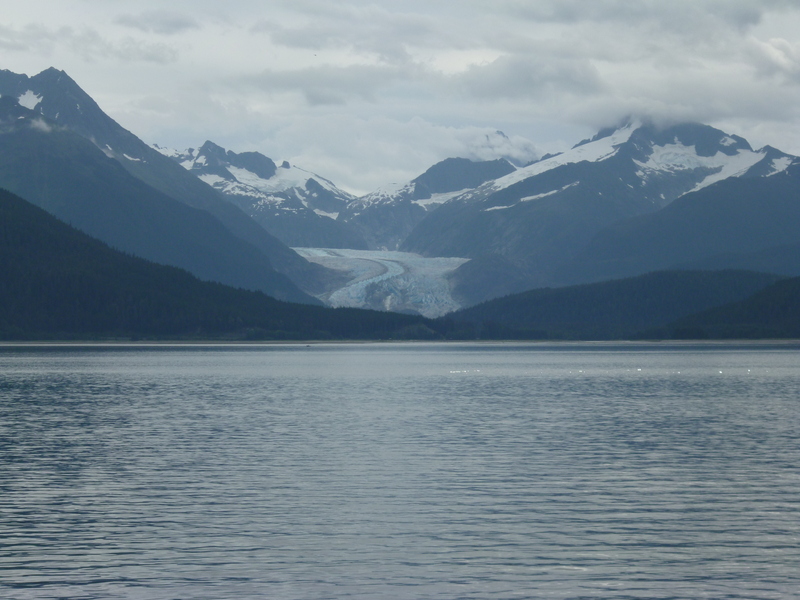 There were glaciers all along the way to Haines. 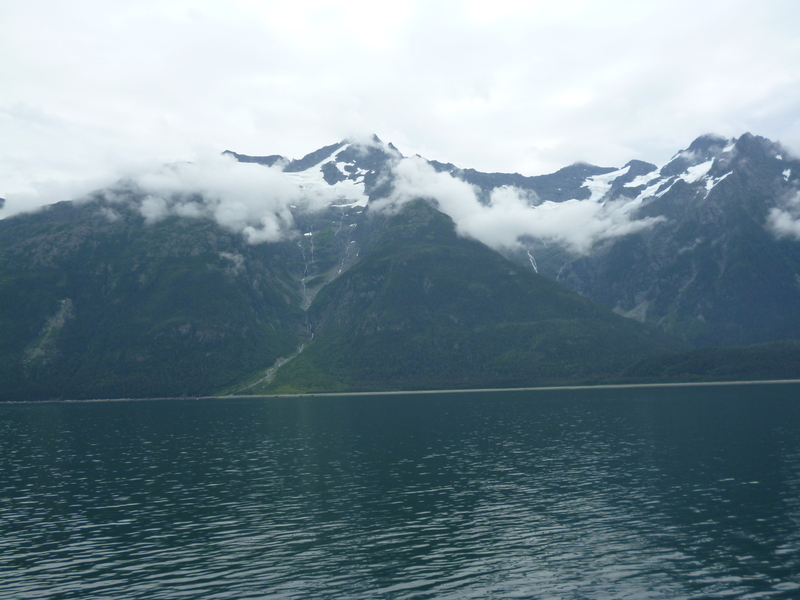 Notice the fishing boat in the water to get an idea of the size of the mountains that enclose the channel up to Haines. So our island hopping, ferry-riding segment of our trip came to an end. 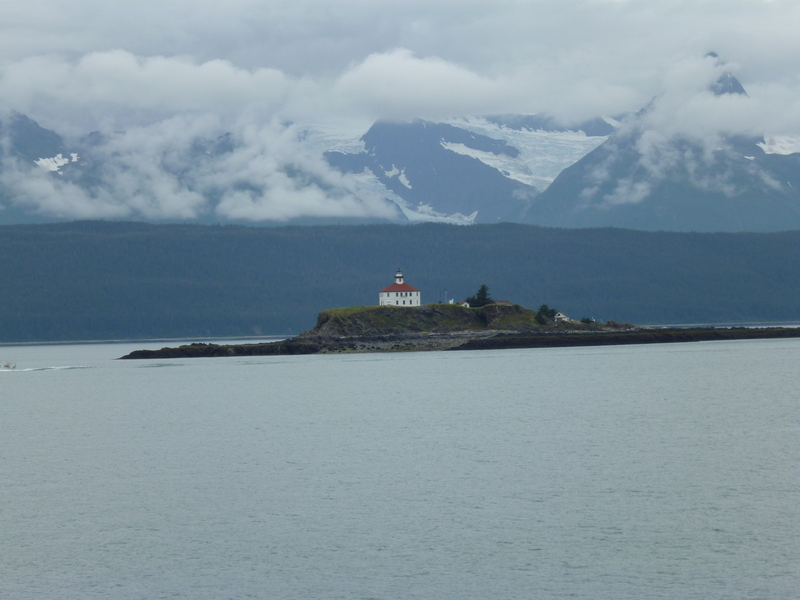 The Alaskan Marine Highway system is a public transportation system that serves an important role of moving people and cargo along the highway. If you are looking to get to all of the islands and have the ability to relax and deal with the delays that will occur, then this is a great way to go. The crew are a friendly bunch of folks and know what they are doing. On every vessel we traveled was at least one plaque where the crew and vessel had come to the aid of another vessel along the waterways, saving the lives of the persons aboard a distressed vessel. The system may not have the punctuality of a railroad, but you will arrive safe and sound while passing through some of the most beautiful landscape in the world. We took off from Haines heading north. 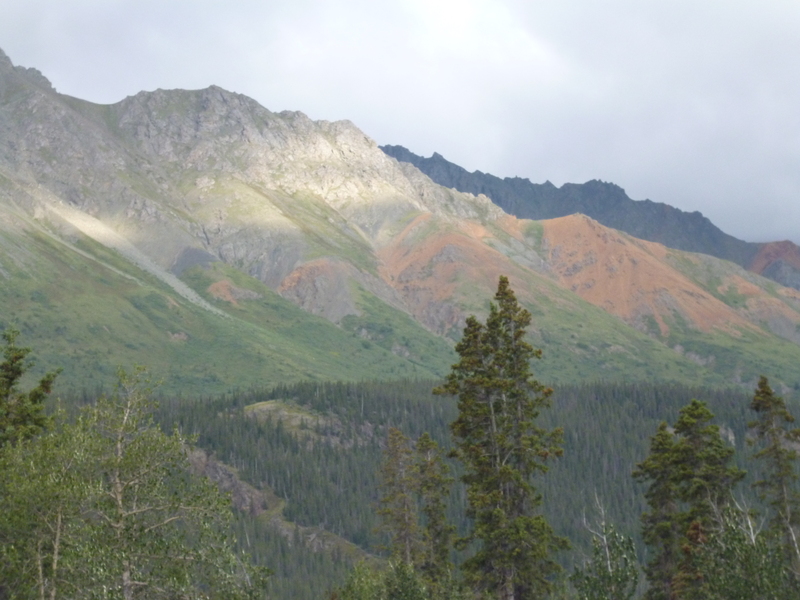 You have to pass through Canada to get to the central part of Alaska due to the mountains and glaciers that block any direct route that would allow you to remain in Alaska the entire way. 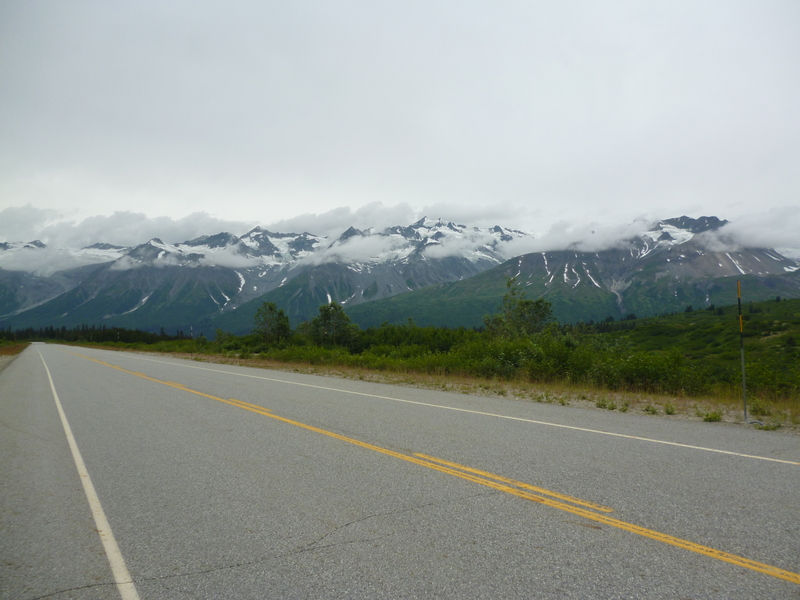 The route was along the Haines Highway, a bypass created in the 1940s to establish a sea-based, land supply link to the Alaska Highway for Alaska during WWII. 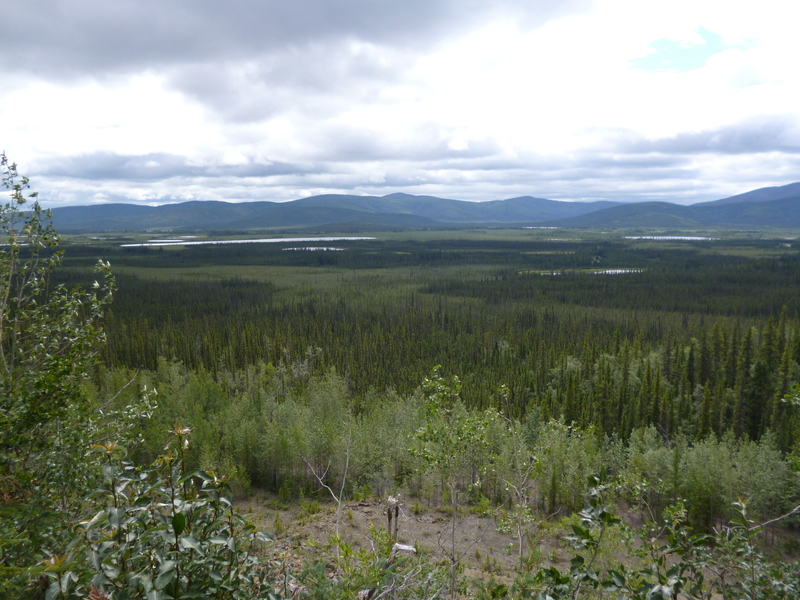 The road passes through British Columbia and the Yukon before re-entering Alaska. The scenery along this route is just breath taking. 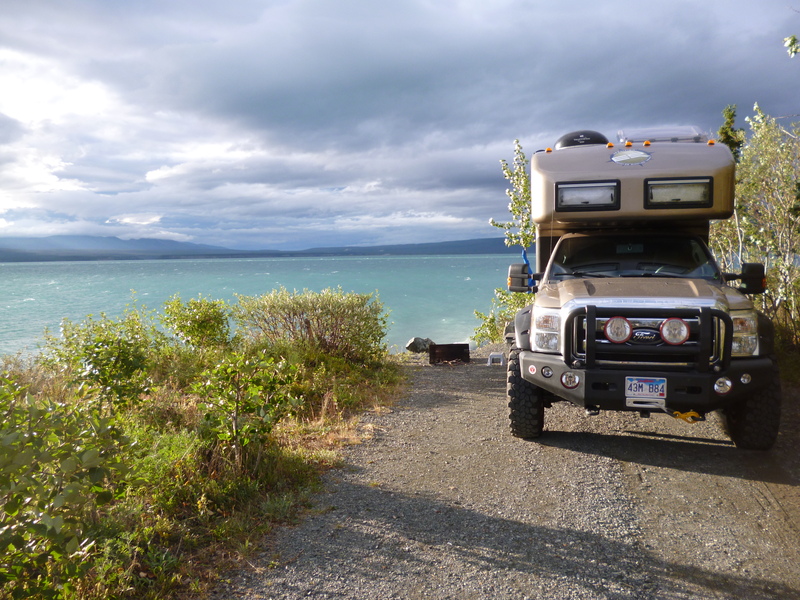 We camped the first night at Kluane Lake at the Cottonwood Campground. Our spot was right on the lake. The lake had some of the glacial flour in the water to give the lake a vibrant shade of blue. We saw a juvenile grizzly bear in the brush about 20 feet from the Roamer when we entered the campground. It was only about the size of a full grown black bear and quickly dashed off when it noticed us, probably back up into the hills behind the campground. 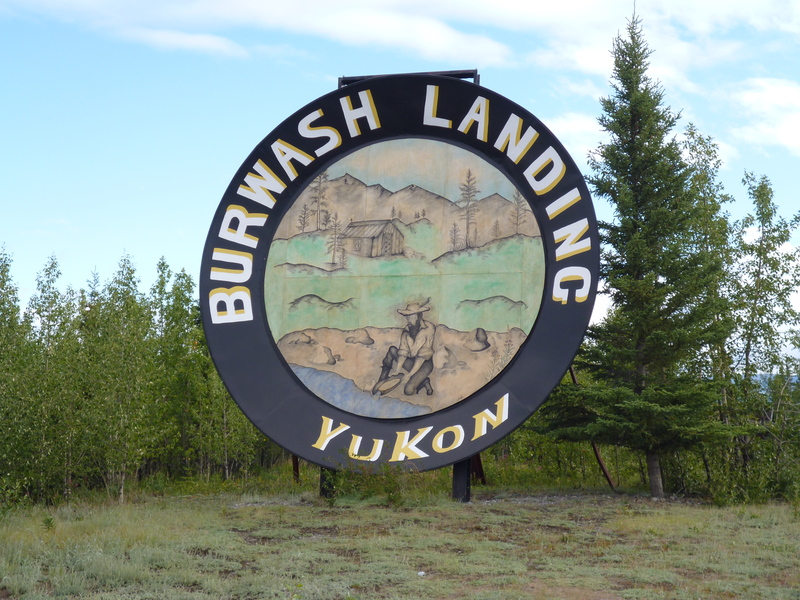 The next day we traveled across the Yukon and saw some of the local attractions, like the world’s largest gold pan. I want to see the gold nuggets that came out of that pan! The museum there also had an amazing collection of mounted animals. The original owner was a naturalist, and obviously a good hunter too. 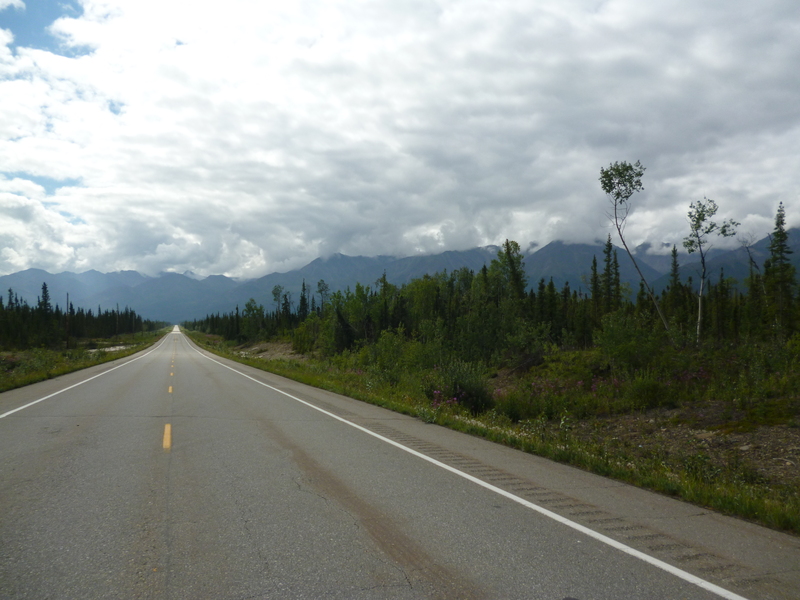 We hit the Alaska Highway at Haines Junction and headed towards the US border. 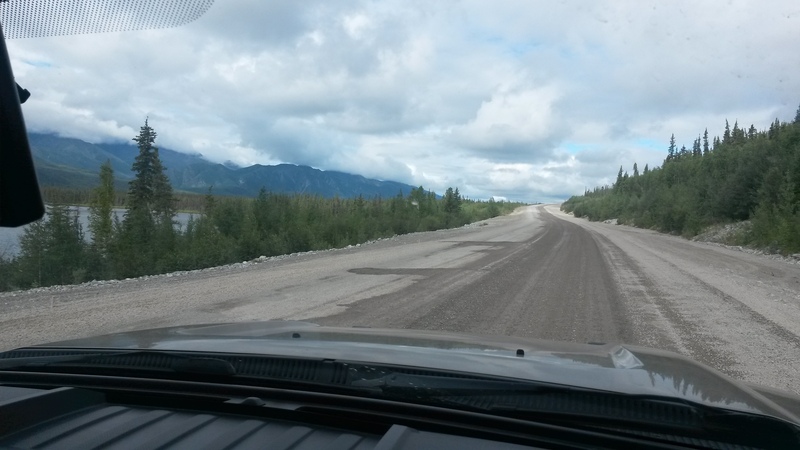 The Alaska Highway is not that bad of a road. Maybe in the past it was, but since we have been traveling mostly back roads, we’ve been on much worse roads in the lower 48 than this. It is part paved and part gravel, where the gravel sections are actually the nicer sections of road to drive on. The paved sections have pot holes and uneven sections that are marked with flags to alert drivers. The road is a very passable road when traveling at the posted speed limits. Our vehicle did pick up a layer of road grime that luckily was nearly the same color. 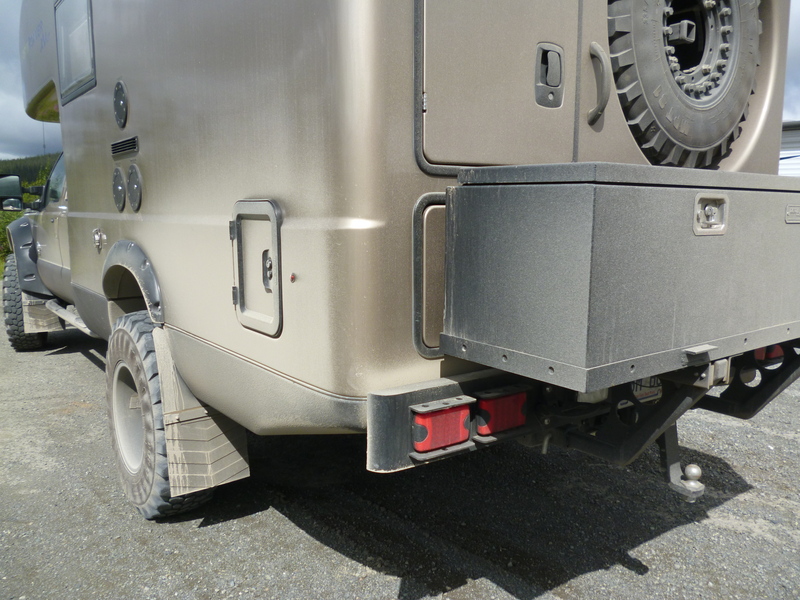 Other vehicles with lower suspensions and no mud flaps were just covered. 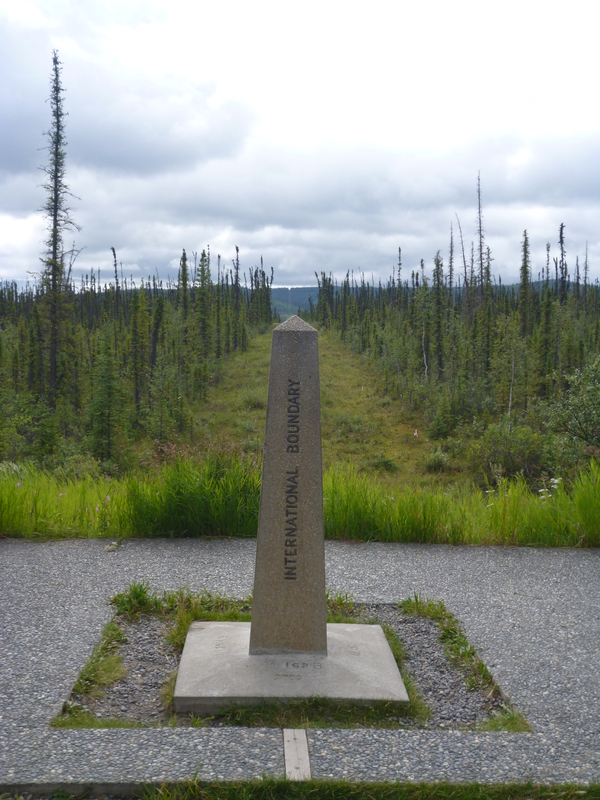 We hit the Alaskan-Canadian border along the 141th meridian. A gap was cut through the forest along the border. Both border crossings were a breeze. Just inside Alaska, and covering about 1000 square miles, is the Tetlin National Wildlife Refuge, noted as an important migratory corridor for many animals and birds. 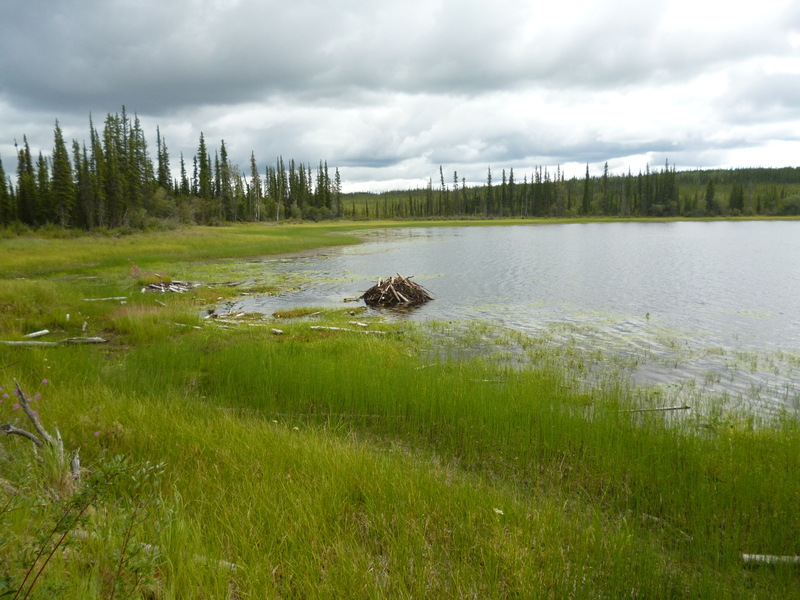 The marshy area is forested by black spruce, which is a very odd looking tree. A tree with a 2 inch diameter trunk can be over 100 years old. This area has the record cold for Alaska at somewhere around -80 degrees, definitely long sleeve weather. The ranger, a native that grew up in the area, said they typically have 160 days below freezing. 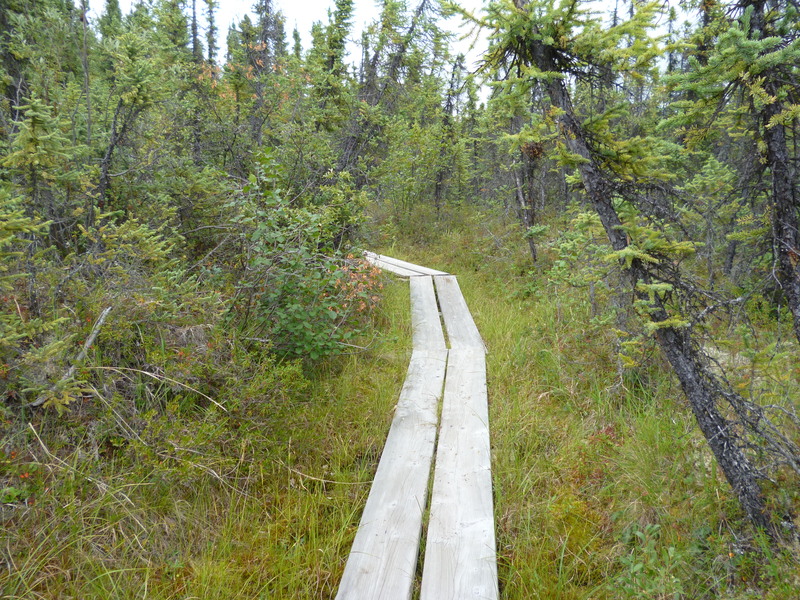 We did a couple of hikes in the area where the path was along boards to keep you from sinking into the peat moss soil. The ground was like a moss covered sponge, which when it thaws causes everything to move, including the roads. We saw a few beaver lodges, but no beavers. The second hike had an interpretive trail that explained the many edible berries and plants along the way, which amazing enough was a lot. After they explain what is edible you realize there is food everywhere there. Even though it is late July, it’s still early spring here in the growing season and many of the berries do not ripen until late August, after the first frost. 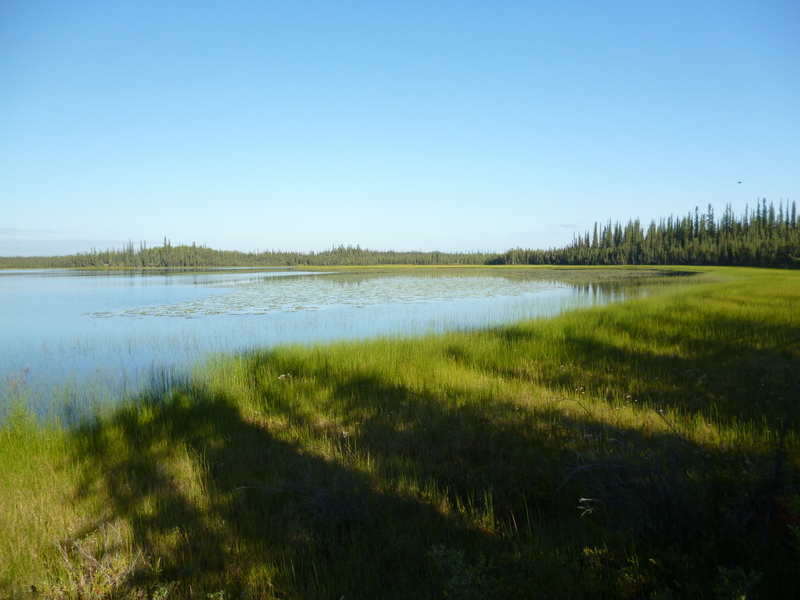 We camped the night at Deadman’s Lake campground within the NWR. There were forest fires in the area but the recent rains have put them all out. Hopefully that will hold true for the remainder of the trip. 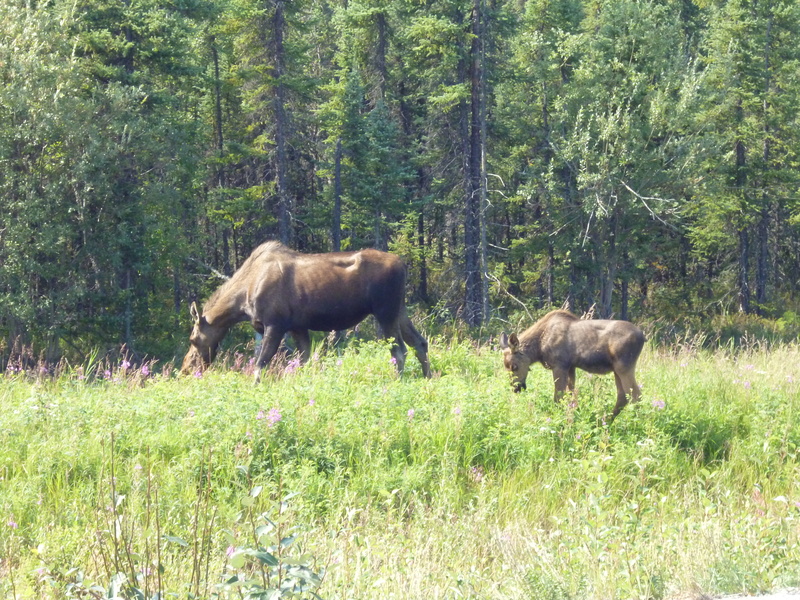 As we continued towards Fairbanks we spotted our first moose in the wild, a mom and baby along the side of the road. Similar to Sequoia with our bears, we then saw five moose that day during the drive, either along the road or standing in the ponds next to the highway. The vistas along the drive are just amazing. Pictures can’t do it justice given the grandeur of the area, with the beautiful mountains ranges and the wide forested valleys. We haven’t seen any yaks or reindeer, but we did stop at one of the noted butchers along the route and picked up some yak steaks and reindeer breakfast sausages to try. 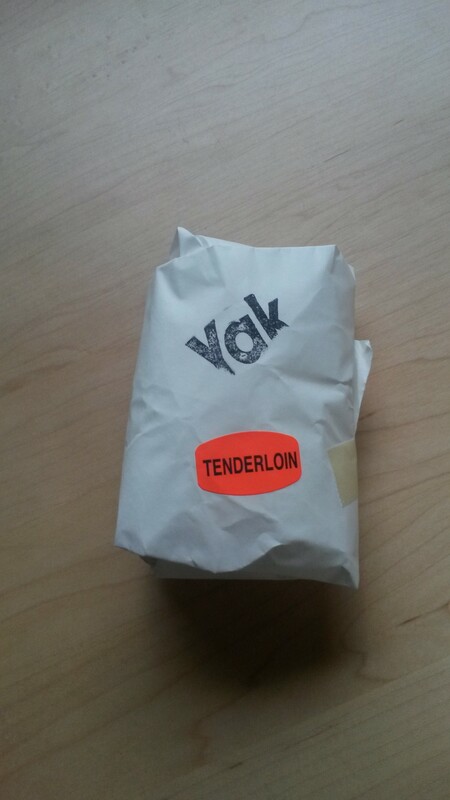 Cooked the yak tenderloins up and they were good. 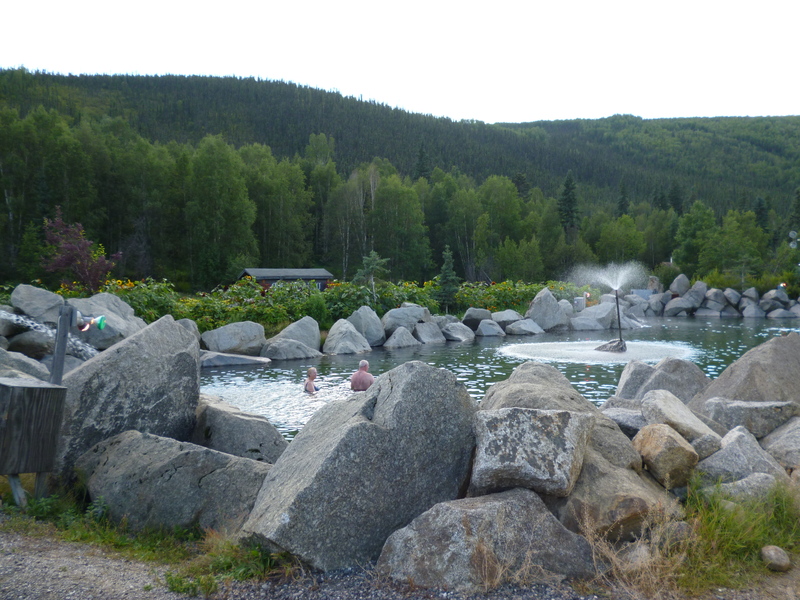 We camped outside of Fairbanks at the Chena Hot Springs for a night. The thermal hot springs were great to soak in until we turned into raisins. 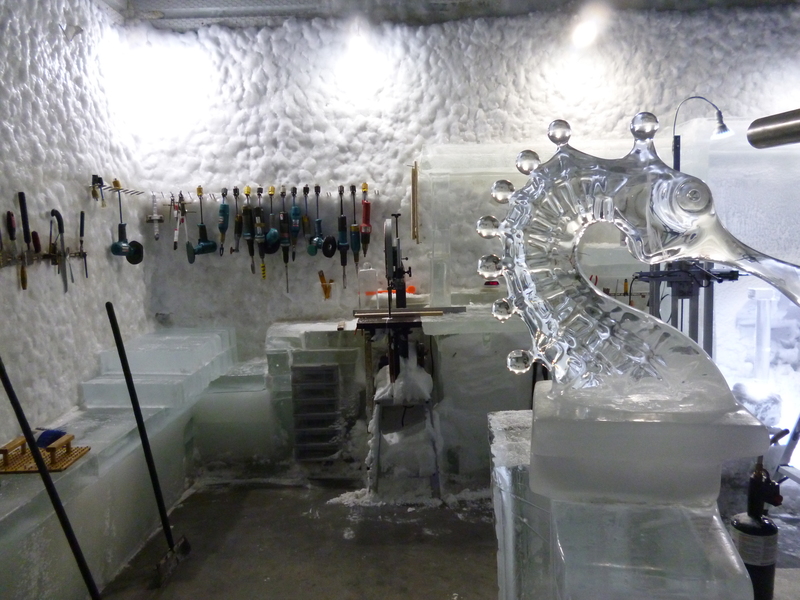 They also had an ice museum there with two local ice carvers that create some pretty impressive works. 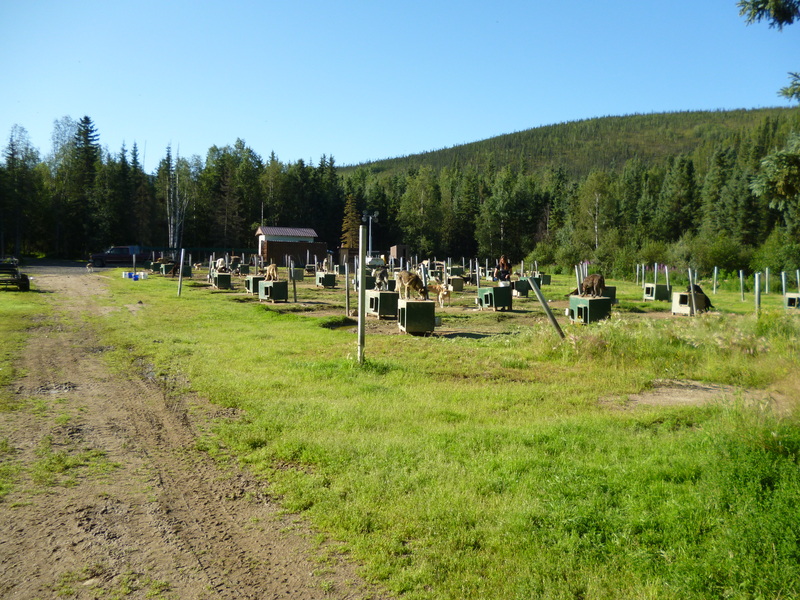 We took a hike in the morning around a beaver pond and came out next to the sled dog camp right at feeding time. They have a golf cart that they pull in the summer and obviously a sled once the snow comes to the area to train for the Iditarod. One of the hardest things to get used to being this far north is that it does not get dark at night. The sun goes down, but it’s still pretty light outside. A local told us it will be another month before it gets dark enough to see stars at night. 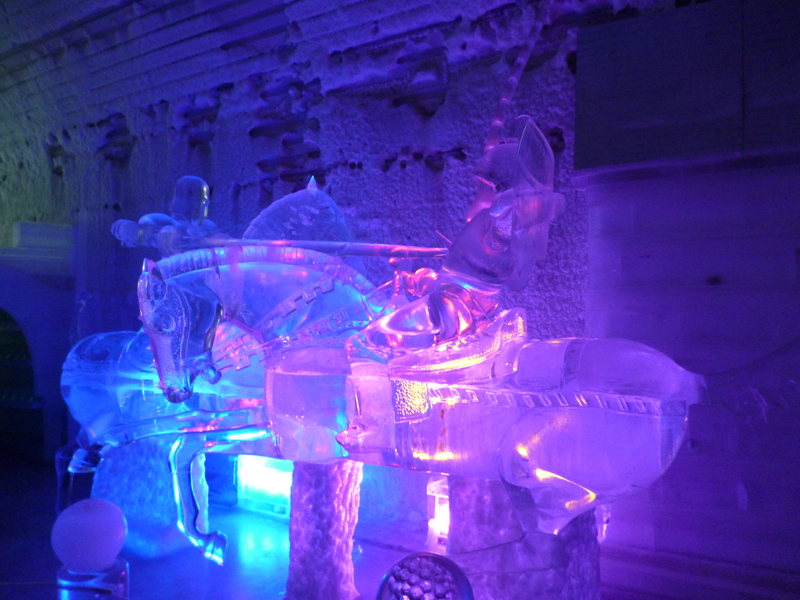 So much for the idea of seeing the northern lights this trip – lol. 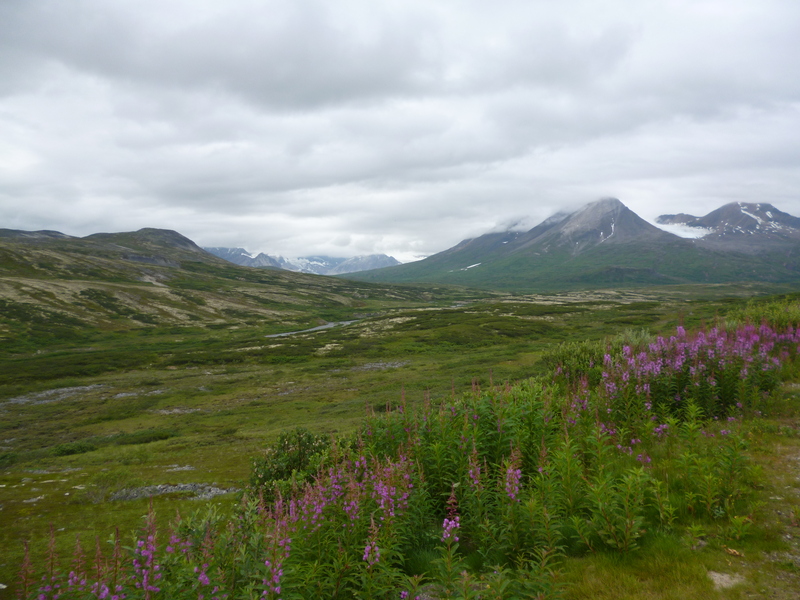 It will be even worse when we get up to the arctic circle for our next stop. 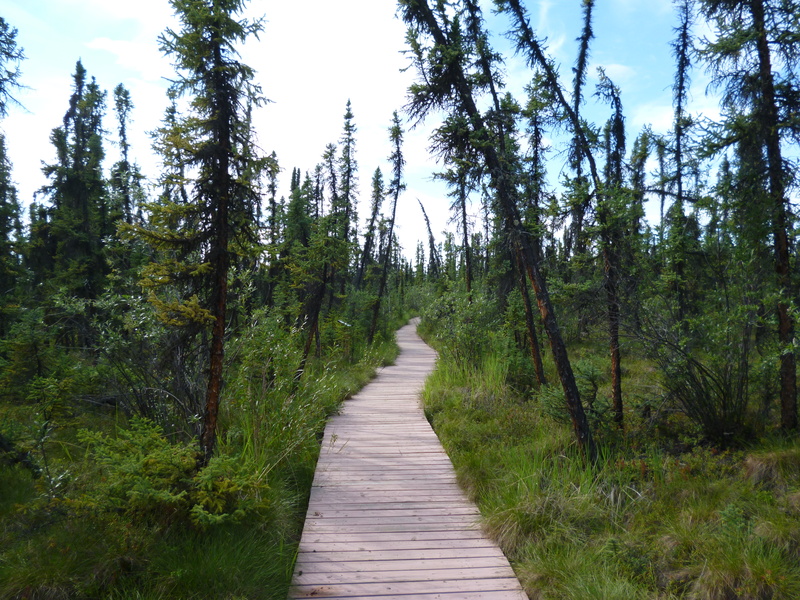 We are in Fairbanks now for a couple of days to relax and explore. I gave the Roamer a bath, Pam did laundry and we’re just catching up on emails and things in general, while we explore the city. 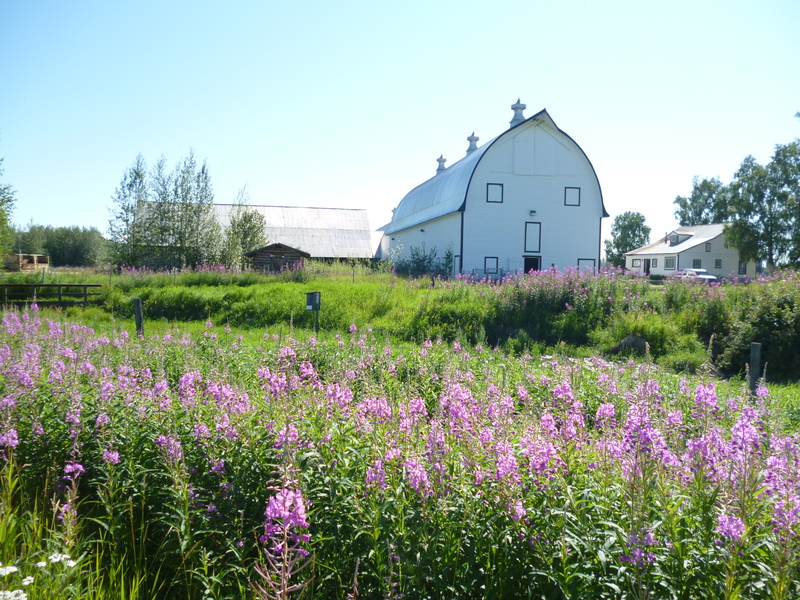 We checked out the local migratory bird area today, their summer location, at what used to be the local dairy with an awesome barn. Some of the birds, like the Peregrine falcon and the flycatcher fly from here all the way to South America for their migration. 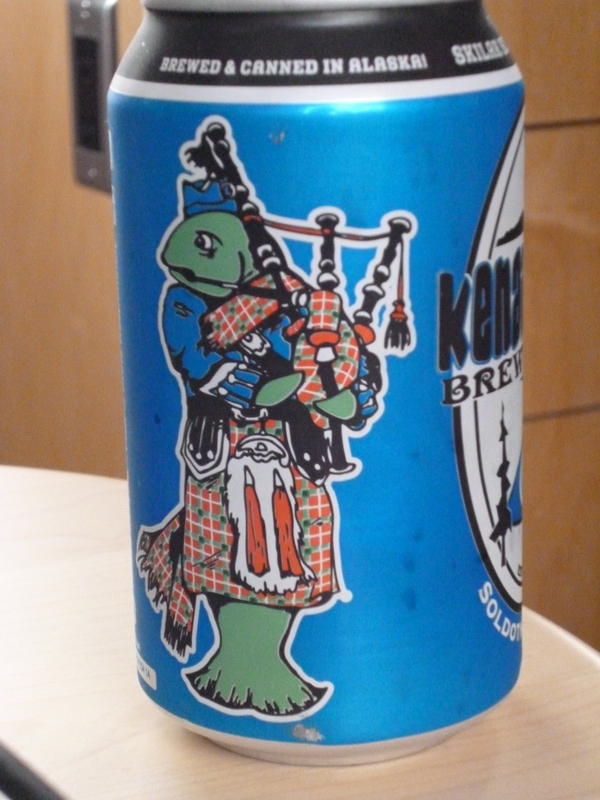 In our quest for natural beauty and good beer, Pam found another Scottish Ale from the Kenai River Brewing Company, located down towards Anchorage. We’ll have to stop in when we get there. I’ve been enjoying the Alaskan Brewing Co. Amber and Icy Bay IPA. We stopped into the brewery when we were in Juneau. Alaskan is a pretty innovative brewery, driven mostly out of necessity to stay competitive while operating from effectively an island with no natural beer resources: hops, malts, etc, other than crisp, clear water. For those worried about my Weber, the replacement grill is being broken in nicely with the various meats and fish we’ve been enjoying. It may not be as rugged as the first (yet), but it will hopefully make the entire trip without the need for repairs.